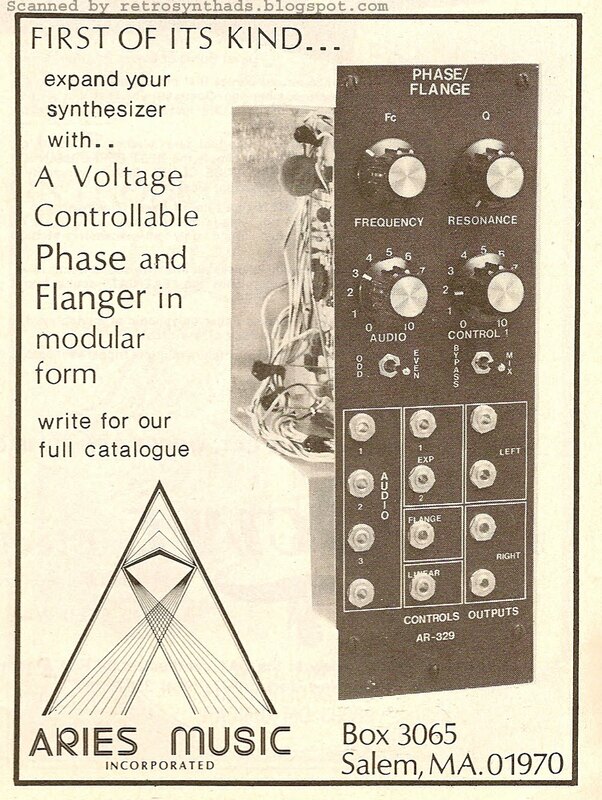 Aries AR-329 Voltage Controlled Phase/Flange Module from page 46 of Contemporary Keyboard Magazine November 1977. Up until November 1977, Aries ads in both Contemporary Keyboard and Synapse magazine were... well.... they were nothing really outstanding - except for that awesome logo! Take a look at these blogged ads for examples - July 77 CK, August 77 CK, March/April 77 Synapse. Then, something happened. They found their marketing mojo and came out with this highly-targeted ad in Synapse. Around the same time, the 1/4-page module advertisement you see above came out in CK. Normally I'm not a fan of smaller ads in magazines, but in this case I'm tempted to make an exception. 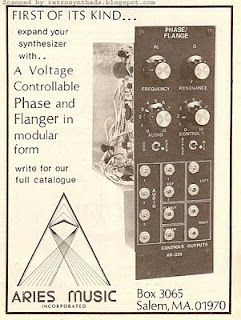 I think Aries found the perfect format for a relatively low-cost way of advertising single modules - especially if this module was as unique as the ad makes it out to be (and apparently it was). Aries used the space well by including a close up of the module itself, with the text laid out beside, and not on top of, the photo. Clean and simple. The font is almost too simple. 1. As far as I can tell, Aries only ran this advertisement twice - Nov'77 and Jan'78. It would have been much better if this ad had run as many times as possible in succession to get maximum impact. 2. It only ran in Contemporary Keyboard - a magazine that I would think has a more generalized keyboard playing audience. I would be inclined to argue that this ad would have been able to better reach more of its target audience if it had appeared in Synapse. But as was pointed out to me in an email after my last blog post, the average Synapse reader may have been more inclined to take action on an Aries advertisement, but that audience may have been a whole lot smaller than CK. In other words, that small slice of modular owners/builders that read CK may have been larger than Synapse's audience as a whole. So, how unique was this module? Unique enough that Aries though that it deserved its own advertising campaign. And that campaign actually started before the ad came out. You can see the first signs of the promotion in the Spec Sheet section of the previous issue of CK (Oct'77). "The AR-329 stereo phase/flange module is a voltage-controlled phase shifter with variable resonance. The manufacturer informs us that its signal-to-noise ratio is better than 7-db. the device is compatible with standard 1 volt/octave synthesizers, and both linear and exponential control-voltage inputs are provided. The unit provides 1800 degrees of phase shift at the fundamental frequency. Price is $159.00 in kit form, and $245.00 assembled and tested. Aries Music, Box 3065, Salem, MA 01970"
Synapse included some similar info in their What's New section of the Nov/Dec'77 issue. "The AR-329 is a voltage controlled phase shifter with variable resonance or "Q" and features 1800 degrees of phase shift at the fundamental." But, those specs don't tell the whole story. Robert Leiner, owner of one of the best Aries sites on the Web, has a great technical description of the AR-329 module and specifically mentions how unique it is. "The AR-329 is a voltage controlled phaser. Usually people think of phasing as a special effect - swooshing, jet-sound, etc. Very few people have had a chance to use a phaser that isn't controlled by an internal oscillator, so fail to discover that a phaser can be uniquely effective timbral modifier." You can read the rest of Robert's technical description of the module on his Web site. "To patch a sine wave to the VC input gives a typical phaser effect -- that is, the comb sweeps up and down as the sine wave's voltage rises and falls. The phased effect is the result of mixing the delayed signal with the primary signal. The Odd/Even switch inverts the phased signal and is very effective. The "Q" control functions like most "Q" controls -- that is, it controls feedback. The AR-329 is designed to suppress uncontrolled feedback however at the highest Q setting at some input frequencies the AR-329 produces a "glitchy" kind of feedback -- it sounds more like static than clear feedback. However, if one backs off the input signal (there is a front panel input pot for this) one can run at the highest Q setting and avoid the static. The sound is very throaty -- very colorful -- a lot like a Clavinet. The AR-329, as are most analog phasers, is a little noisy. When the phaser is at the end of my signal chain, I always noise-gate it with a VCA. If the phaser is fed a steady amplitude signal (i.e., from a VCO or the noise source) then noise is not a problem." Overall Kevin is very happy with his AR-329 and finds that it can perform outside of its traditional role of a phase/flange. "Often, I run the module at minimum Q with no CV input and just set it as a form of fixed EQ. This is handy particularly when one wants to vary the amount of "boominess" in the bass. If anyone else has anything to add about this module, please don't hesitate to leave a comment below or email me. I used to hang out on my lunch hour (and social studies class) at a store on Yonge Street in Toronto in North York called The Keyboard Shop. They had a room in the back with Moog, Korg and Arp gear. That would have been late 78, early 79. The ads you have in here remind me so much of those days! Amazing! Thanks!